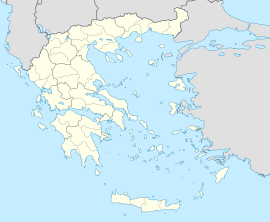 Inachos (Greek: Ίναχος) is a former municipality in Aetolia-Acarnania, West Greece, Greece. Since the 2011 local government reform it is part of the municipality Amfilochia, of which it is a municipal unit. It is located in the northernmost part of Aetolia-Acarnania. Its land area is 585.382 km². Its population was 4,760 at the 2011 census. Its municipal seat was the town of Neo Chalkiopoulo (pop. 569). Its largest other villages are Empesos (pop. 444), Amorgianoi (363), Thyamos (386), Perdikaki (356), and Nea Malesiada (308).